You will freeze every winter. You will eat your fair share of wings (in Buffalo, we call them wings, not Buffalo wings cause that’s all there is). 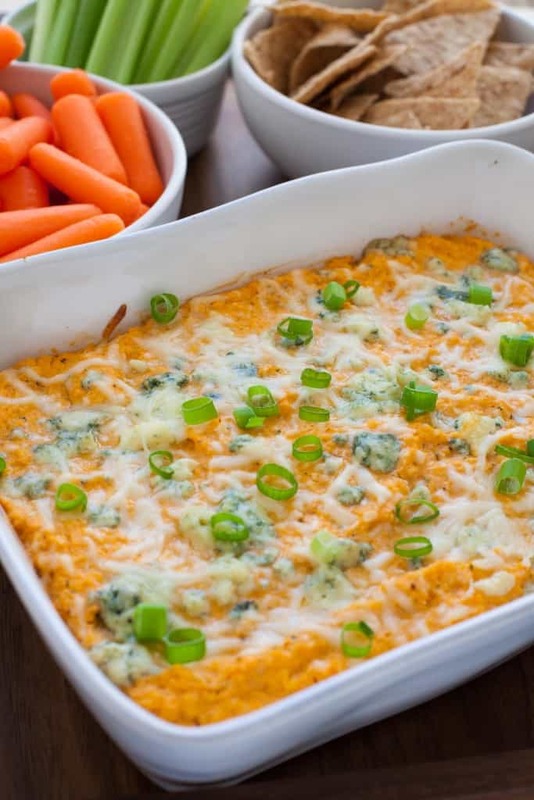 You will find Buffalo chicken wing dip at every single party and gathering you attend. For a quick play-by-play on how to make this recipe, check out my video below! I was fine with the first two guarantees and more than fine with that second one. One winter, we had an entire week off of school (5 days straight) because of a blizzard – it was the best week ever. However, as someone who decided to go vegetarian at a young age (12), those last two guarantees got pretty old pretty quick. For like the first ten years of being a vegetarian, chicken wings were the only food I really missed (and in college, I was known to have a few late night slip ups involving wings). Probably because they were such an integral part of my Buffalo upbringing. Maybe subconsciously I didn’t feel like a true Buffalonian because I didn’t eat wings. An outsider in my own hometown trying to make my way back in. Maybe that’s why the lust over wings lingered. 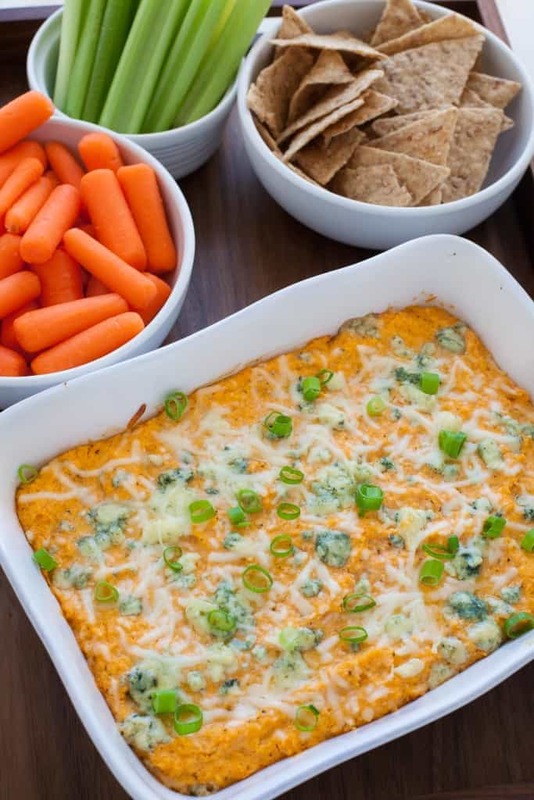 Anyways, I started to notice this gripe at family parties and gatherings because someone would ALWAYS make chicken wing dip (again the Buffalo gets dropped when you live there). And I would be like damn, I wish there was a vegetarian-friendly version so I could join in on all the Buffalo dipping fun. It always looked so deliciously cheesy and rich and spicy and I wanted IN on the action. But every year, I would lament that no such vegetarian version existed. UNTILLLLLL NOW (said in my most dramatic announcer voice). 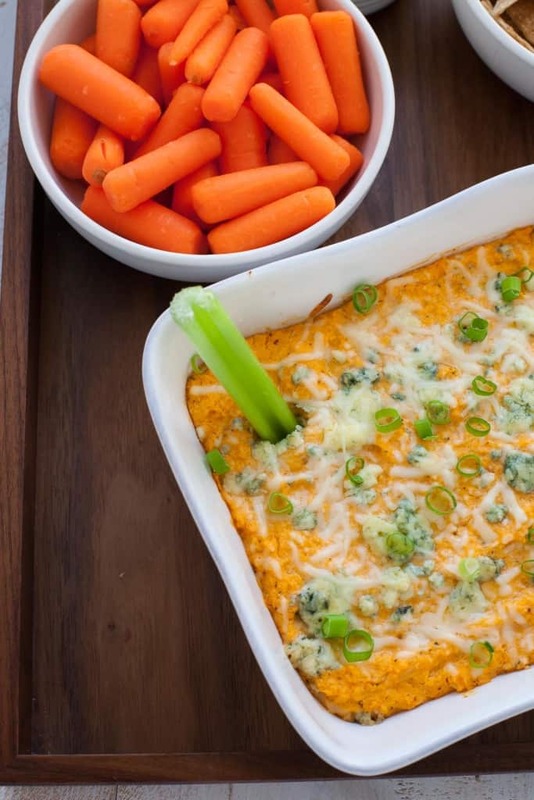 That’s right I have a vegetarian chicken wing dip recipe made with cauliflower that’s going to knock your socks off. I’m not kidding when I tasted this I almost cried out of sheer happiness because it’s as good as the original. Don’t believe me? Ask my carnivore Buffalo-born husband and he’ll tell you how he almost finished the dip off in one sitting :). 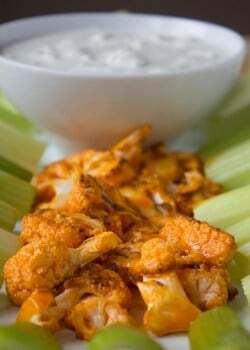 I got the inspiration for the dip from the Buffalo cauliflower wing craze that happened a couple years back. I thought if we can make Buffalo wing substitutes out of cauliflower florets, why wouldn’t we be able to make a wing dip out of them?! 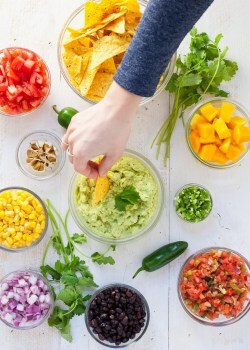 The dip is super easy to make too – everything goes into the food processor! And then transferred to a baking dish, popped in the oven and voila! I decided to roast the cauliflower in the oven first because I love roasted veggies and think it brings out more flavor but if you’d rather microwave or steam your cauliflower as a time saver, go for it! 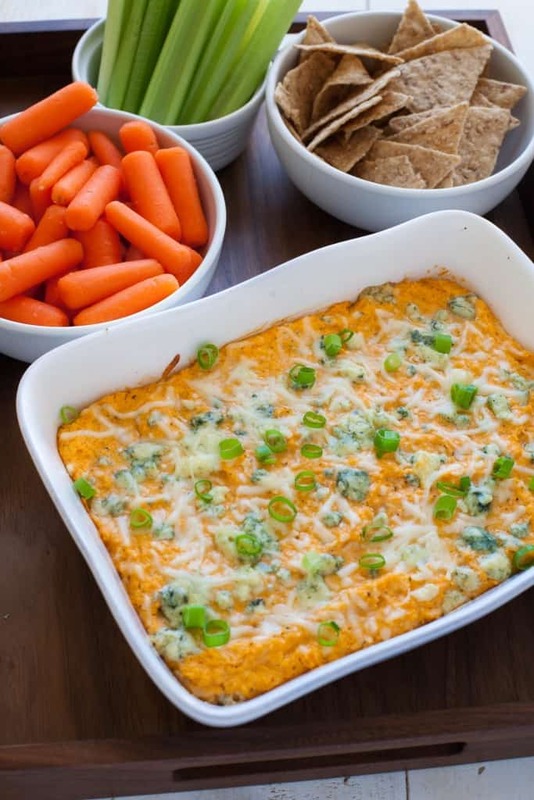 You’re gonna love this dip for your Super Bowl party this year. I swapped the chicken for cauliflower. Replaced half the cream cheese with Greek yogurt. Cut some of the cheese and used ranch seasoning instead of dressing. 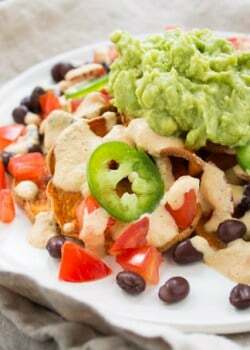 So not only is it deliciously spicy, cheesy and indulgent-tasting, it’s vegetarian, gluten-free, has more fiber, less fat and is super satisfying. 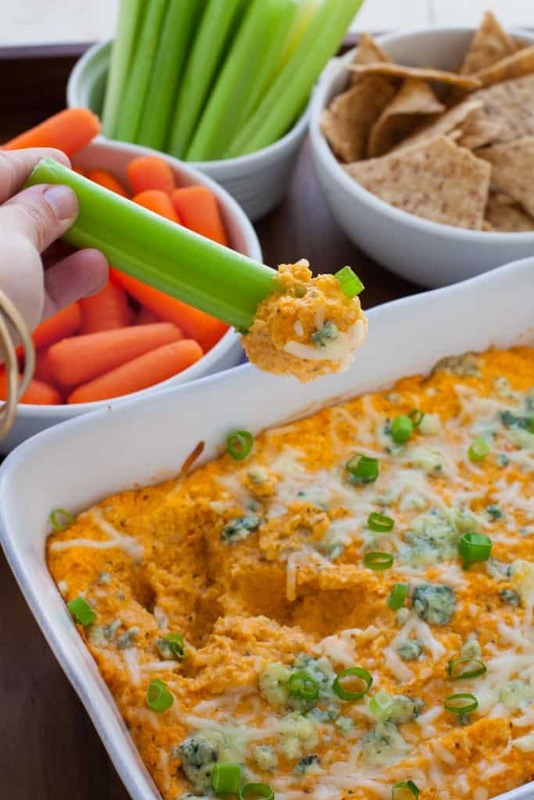 Serve this dip up with carrot and celery sticks and a bowl of tortilla chips and you’re ready for some football! Tell me, how are you celebrating the Super Bowl this year? Any must-have game day eats? 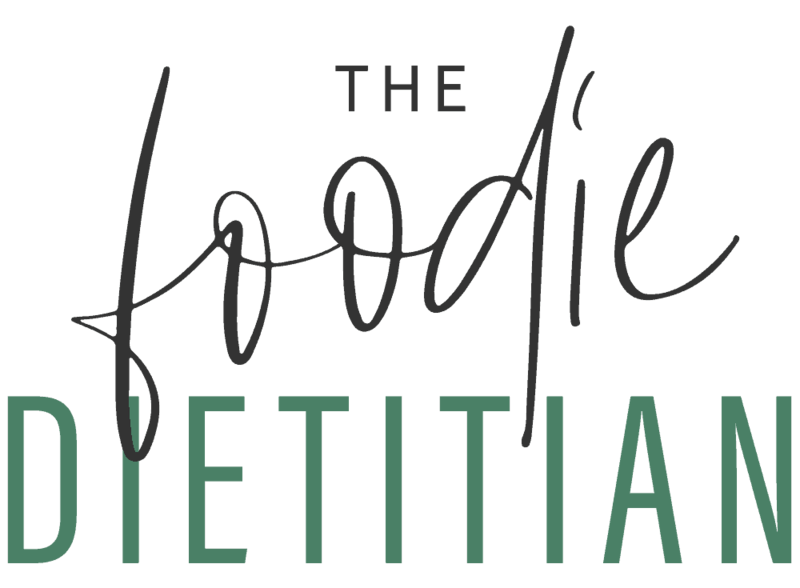 For more Super Bowl eats, check out my other recipes below! YUM-O!! I made this for Super Bowl Sunday and it turned out so good! 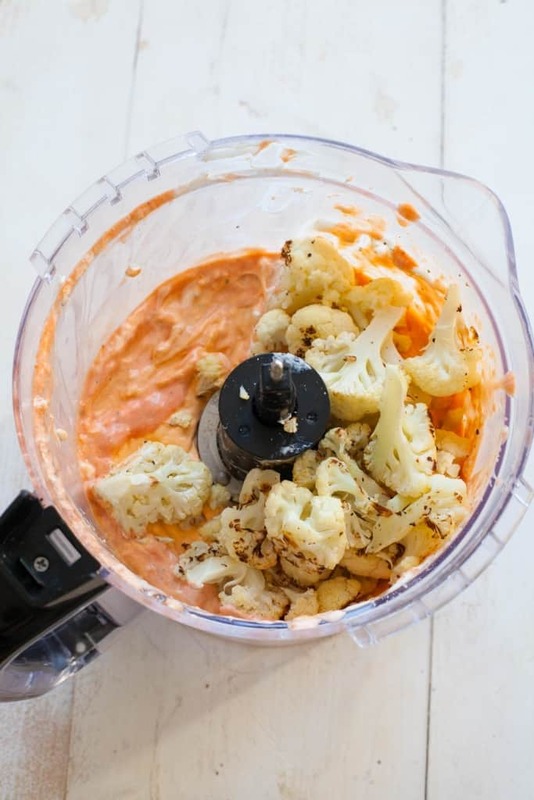 You would never know there is cauliflower in it! Thank you for the recipe! Hello, can I use sour cream in substitute for cream cheese? Hi! Yes, you can but it will be less thick and might taste more sour. 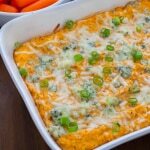 Is it possible to make this ahead of time (like the day before) and then pop in the oven to serve later? It would probably need to go in the oven longer after refrigeration, but wanted to see if you had tried it! Hey Alyssa, I haven’t tried it but don’t see why you couldn’t make it ahead of time and then pop it in the oven later! You probably will just need to increase the cooking time slightly. Just looking for clarification. Is the ranch seasoning the dry powder or the liquid salad dressing. Hey Jennifer! I love Toronto! Great question – the ranch seasoning is the dry powder. Hahaha now that is a super bowl WIN in my book! Love proving the hubbys wrong about recipes ;). Thanks for sharing – so glad you BOTH loved it! Made this last year for Super Bowl party and loved it. Thanks for the reminder to make it again! I am making this for a Superbowl Party. Bills Fan here, so even though we didn’t make it I am repping the Wing Dip. My bf is on keto so we can’t use Greek Yogurt. How much cream cheese should we use all together if we aren’t adding the yogurt? Hi Amy – love that you still repped the wing dip! If you don’t add yogurt, you’ll want to use 8 ounces of cream cheese. Ps. Maybe next year for the Bills?! (fingers crossed). I totally agree about not calling it Buffalo dip lol. I’m from Lockport just a car ride away, and we LOVE chicken wings. There’s always a dip around. I’m gonna try this one as a healthy option. Haha yes! Always nice to hear from a fellow Buffalonian. Hope you enjoy it! This is one of my favorite recipes. I save some of the cauliflower and don’t puree it so that it reminds me of chunks of chicken like in the real thing. So tasty!!! Yes! Love that. Thanks for sharing, Gretchen! I have a question what if you don’t have a food processor? You could try a high speed blender! This looks so delicious! Wondering if I can make it this morning and then just put it in the fridge till tonight to bake nice and fresh? Thanks! Made it this weekend…husband approved, co-worker approved! I have never been able to enjoy this b/c of being vegetarian. I loved it and the spice was awesome. My eyelids were perspiring. Ha! Thanks for sharing. Will definitely be making this again! Woot, woot! So glad you could finally enjoy it, Kathleen! I felt the same way! Good to know – thanks, Mary! Yay! So glad you loved it, Tina. And that your toddler enjoyed too up to a point ;). I was enjoying the leftovers for snacks (and lunch!) too. Thanks, Janice :). So glad you enjoyed it! 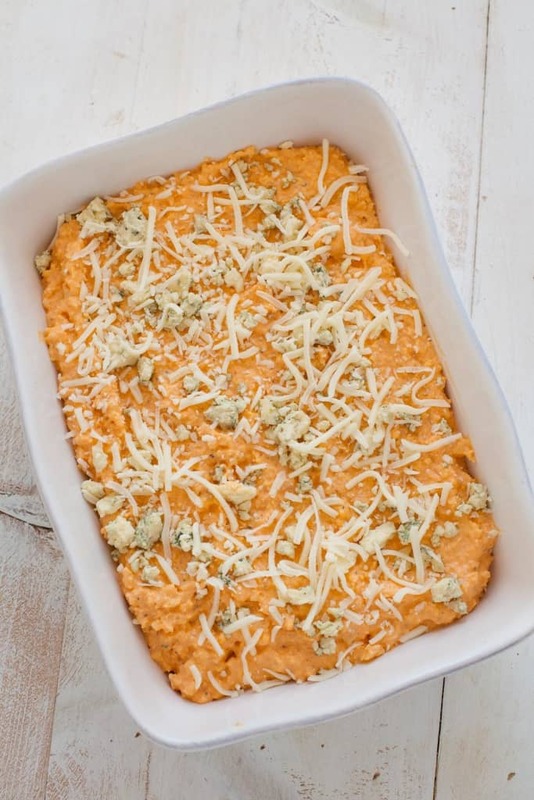 My BF loves buffalo chicken dip, but I always feel left out when he brings it to a party. 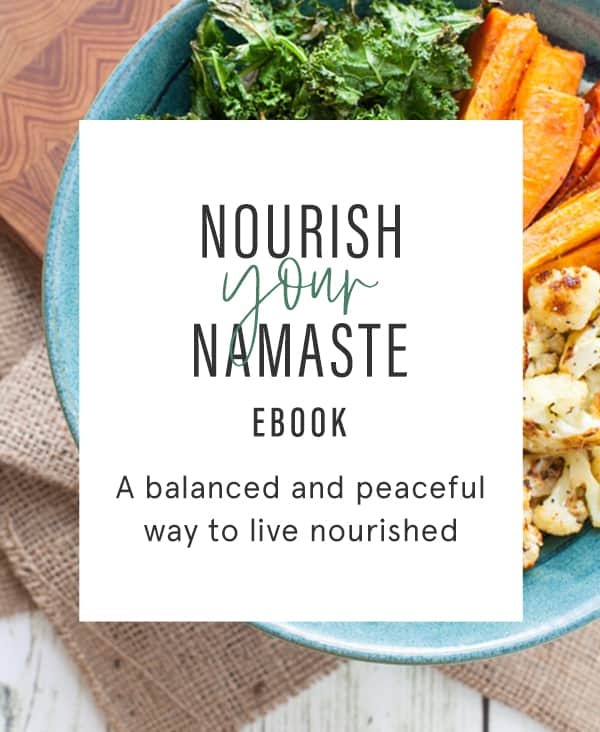 This looks like such a tasty vegetarian version!! Not sure if I should admit this, but I never connected Buffalo wings …with Buffalo. Thanks for enlightening me on food history! 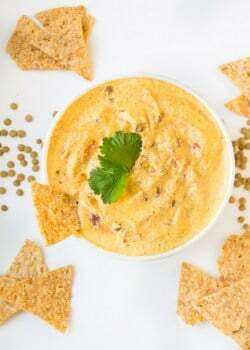 (: Now I like Buffalo dip…but pretty sure I’ll LOVE this dip. It’s gonna be on our party table this weekend! Love this idea! I actually am not a huge hot sauce fan so I will probably cut that in half and add more blue cheese but this sounds likea great substitution! Thanks, Jess! Hope you enjoy! 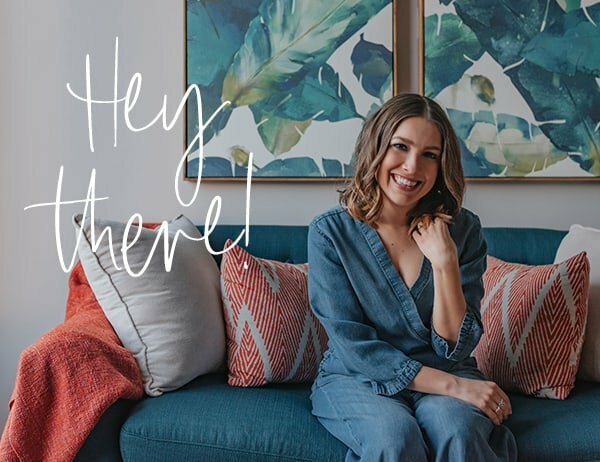 I love the story that goes with this post Kara! So funny! I never knew people from Buffalo don’t call it “Buffalo Chicken Wings!” Now I do! Great recipe as usual, I can’t wait to try it!